We love family movie nights, and snuggling up together to watch our favorite movies. Valentine’s Day is coming up in a few weeks, and a family movie night is a perfect way to celebrate together! I’m sharing a list of our favorite Valentine’s Day movies that are great for families. So…grab your cozy blankets, make some Pink Hot Chocolate, and get ready for an evening of Valentine’s Day movie fun! Most of them are rated G, and a few are rated PG. Common Sense Media is a resource that I’ve used to check movies for more rating information. The original version is definitely my favorite, and the one we watch. I have loved it since I was little! The spaghetti scene? Yep–one of the sweetest Disney movie moments ever! Judy Garland stars in this fun musical, and it’s charming the whole way through! We always called this the “alligator” movie. Curious now? It stars Fred MacMurray, and it’s SO SO fun! I just love this movie, and I think it’s one of the sweetest love stories. In fact, I cry every time I watch it. The Tin Man searching for a heart makes Valentine’s Day a great time to watch this award-winning film, and introduce it to your kids! Hayley Mills stars in this Disney musical, and it’s another one of my childhood favorites. An oldy, but a a goody! This is a coming-of-age story of a girl and her horse during the Great Depression, and about pursuing your dreams. Classic Disney cartoon and love story! I had to add this one in, because my kids love Alvin & the Chipmunks cartoons! It’s a fun, silly Valentine’s movie! A curious and lovable robot falls in love! Just love your “blog” and just everything about you!!! Such a lovely name too! So want to try the popcorn what can I use instead of the cinnamon red hots I don’t think we have them here in SA. Do you have cinnamon bears? You could chop them up and add them. What about hard cinnamon candies? You could crunch them up in a bag with a rolling pin, and add them. Love your blog… its my favorite! 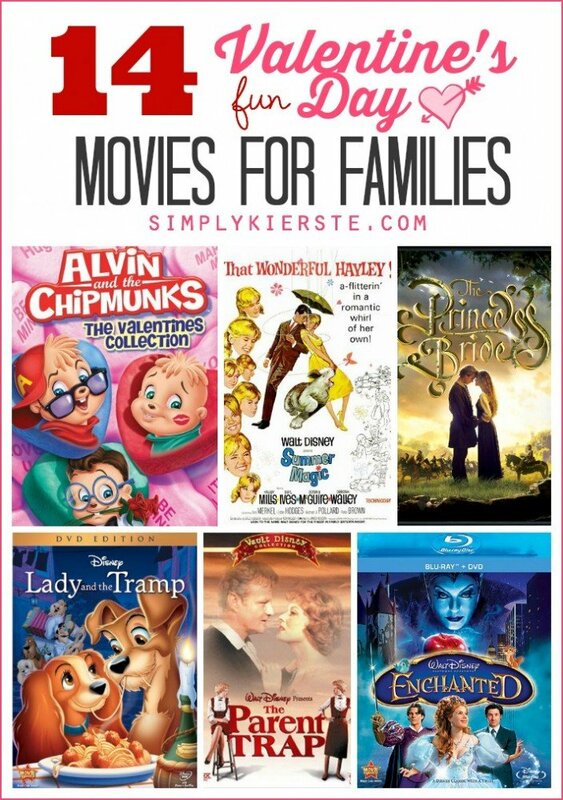 Thanks for the fun movie ideas…I’m planning our family valentine’s night and this list is perfect!! What great ideas! I made the popcorn Sunday night. The kids loved it! Thank you for sharing your ideas! You are fabulous! Yay! I’m so glad they loved it!!! Love the movies you listed. I haven’t seen two of them, “The Happiest Millionaire” and “Summer Magic”. Great idea! You have to watch them, they’re so good!!! What a great list!!! My girls are 3 and 5, so they are the perfect age for me to introduce most of these to. And I love Summer Magic – for Hayley Mills and Burl Ives! Great list! Thank-you! 101 Dalmatians would fit right in too. For sure! We love that one too.